Make your own collection of botanical watercolor paintings with this instruction book. Once upon a time, a vase of beautifully arranged flowers was the perfect subject for a watercolor still life. Today, indoor house plants reign supreme and palms have replaced peonies as the botanical of choice for artists. With clear step-by-step instructions, illustrator and plant lover Nikki Strange shows you how to paint a range of lush, leafy plants. Learn fundamental watercolor techniques as you recreate the glossy leaves of a monstera. Master the art of mixing delicate hues by painting different succulents. Duplicate the intricate leaves of a fern with a variety of brushes. The instruction book is printed with light guidelines for each project. 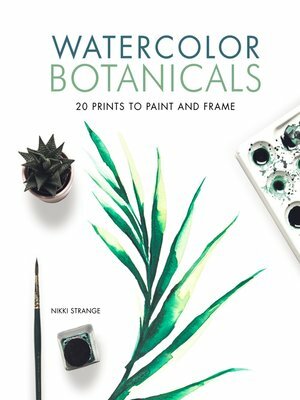 With Nikki's beautiful artwork to follow and photos of dreamy interiors to inspire your decorating, this book has everything you need to add a botanical touch to your space. Nikki Strange is a London-based designer of stationery, accessories, and greeting cards. Her products are stocked widely in the UK (including at Topshop and Selfridges) as well as in the US, Australia, Hong Kong, and across Europe.